Could there be a connection between the late Roman coin hoards uncovered in the immediate hinterland of East Wansdyke and the presence of the great earthwork in this part of Wiltshire? The recent discovery of the Stanchester hoard - the latest dated group of late Roman coins yet recorded from the county - invites such a question and, arguably, even points the way to an answer. 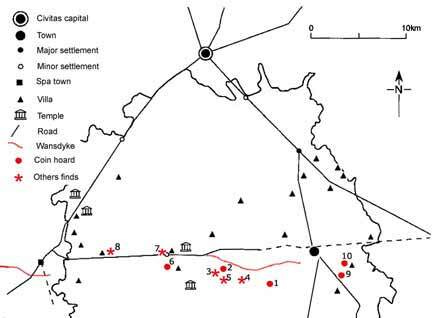 The aim of this paper is to propose that the cumulative evidence is highly suggestive and points to a late Roman/post-Roman construction date for East Wansdyke ranging between the opening years of the 5th century and circa AD 450. 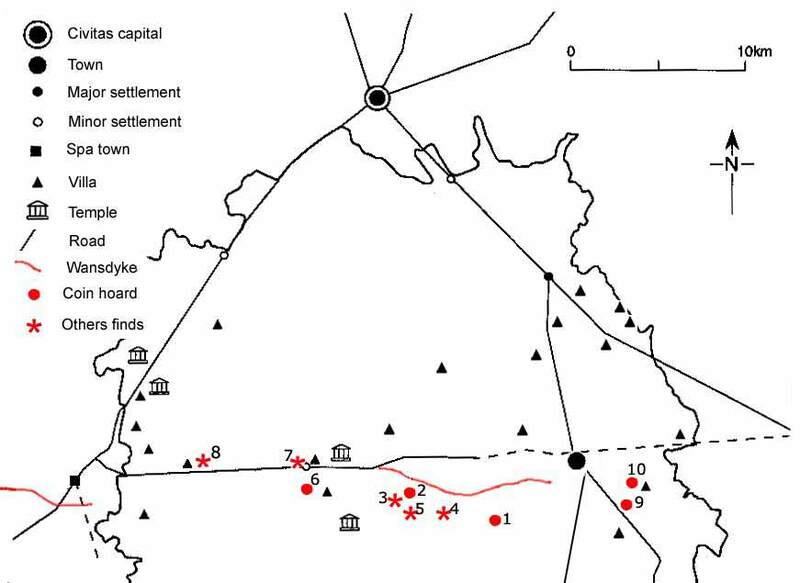 Highly suggestive maybe, but can it be proved that there was a relationship between the hoards and, maybe, other finds in the area and the location of the earthwork (see fig. 1)? The short answer is no. From the secretive nature of treasure concealing, it follows that coin hoards were never likely to be found on or within the immediate shadow of the dyke, still less one as imposing as this. With its commanding profile in the landscape and the subject of close monitoring, the dyke would have been the last place in which anyone would place treasure they hoped some day to re-claim. Some of the most up-to-date views on the dyke have appeared recently in Roman Wiltshire and After (edited by Peter Ellis and published by the Wiltshire Archaeological and Natural History Society, 2001). One theory cited here is that the earthwork was constructed in the late 4th century, but in discussing this Peter Fowler argues that the dyke built in the Roman mode was constructed towards the end of the 5th century to face a military threat from the north. But the apparent widespread outbreak of violence following the Roman withdrawal, it has been claimed elsewhere, possibly provides the context for the final-build-up phases of both East and West Wansdyke  and for Bokerley Dyke (11 miles south west of Salisbury) where it blocks a Roman road, and still forms the county boundary between Hampshire and Dorset. Both the latter and Wansdyke in fact lay close the boundaries of the territories of adjoining civitates. More specifically, it has been suggested that the north-facing East Wansdyke may have been built close to the boundary between the Belgae and the Dubonni, based, as they were, on the cantonal capitals of Venta Belgarum (Winchester) and Corinium Dubunnorum (Cirencester). Further south, in south-west Wiltshire, the Old English place-name of Teffont is considered to suggest the presence of the eastern boundary of the Durotiges, based on Dorchester. The presence here of coins (the latest of them of Honorius, (AD 395-423) and other material uncovered points to the existence of a shrine site. Cantonal organisation, of a diminishing and reducing form, must have still been in force, and if so, it may have heightened tensions and triggered rivalry over resources between neighbours in the late Roman, early post-Roman periods. Ken Dark argues that the boundary, if not Wansdyke itself, must have been in place by the sixth century at least and that, on balance, it is a 5th /6th century British linear boundary, facing north and incorporating hillforts in its line. Fig. 1: A map of north Wiltshire showing sites discussed in the text. (Click on the map to enlarge). Sites numbered on fig. 1: 1 Stanchester, 2 Bishops Cannings, 3 Roundway Down, 4 All Cannings, 5 Wayside Farm, 6 Bromham, 7 Sandy Lane, 8 Gastard, 9 Castle Copse, 10 Chisbury. The Stanchester find, so named after a nearby Romano-British villa, is the most important in this discussion and will therefore be treated in more detail. It was uncovered by a local schoolboy in a field at Wilcot, in the summer of 2000 in the Vale of Pewsey, a short distance south of the dyke. The importance of the hoard is beyond question. The latest coins in the group were struck in AD 406, making it the latest dated Roman coin group from Wiltshire. Following a public appeal, all the coins are now safely in the possession of the Wiltshire Heritage Museum at Devizes. The museum acquired the hoard for �50,000 - the most expensive item it has ever bought. In the context of this discussion, the significance of the Stanchester hoard, in the Vale of Pewsey, lies in the closeness of the find-spot both to the nearby villa (partially excavated in 1939 and 1969) and to East Wansdyke. Late Roman villas at key sites, here and in West Country, are believed to have taken on administrative functions of some form, with military or quasi-military officials supervising the collection of the annona, or tax-in-kind - in this case grain supplies for the local towns and the Roman Army on the Continent. It has been pointed out that Margaret Gelling  the leading British place-name scholar - considers that the late Roman villas to which the Saxons later attached the name -chester (such as Stanchester or Woodchester, Gloucestershire) were exceptional in some way, and may have had an administrative role in Britain at the end of the Roman period, or in the later so-called Dark Age phase of post-Roman activities. Fig. 2: The Stanchester hoard storage jar, with some of the 1.196 Late Roman coins which were recovered in 2000, as featured in a newly published study, Romano-British Coin Hoards (A Shire Archaeology Book). The Stanchester hoard is outstanding, of its kind. Its many highly prized pieces included an unusually large number of elaborately engraved silver miliarenses. In all, there were 33 of this type of coin  a coin issue bearing some of the finest examples of imperial busts of the period. 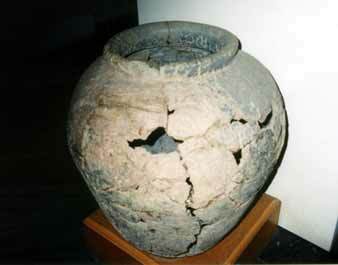 Many of the pieces are said to be rare, some unique, and most virtually in mint condition. All had been concealed in a grey flagon made at the well-known pottery production of Alice Holt in present-day Hampshire. But there are other reasons why I consider the Stanchester finds to be of supreme importance. Three gold solidi of Honorius were among the 1,196 coins uncovered. Late gold solidi are uncommon in Wiltshire. But apart from the late date (latest AD 406), the significance of the buried collection lies in the find spot, and what has been described as the almost certain association of the hoard with the known nearby Roman villa of Stanchester, and the proximity of the nearby Wansdyke earthwork. It so happens that in this broad area the great dyke bears a striking profile across the chalk downlands  in its day quite possibly a dual purpose symbol of organisation and power, directed at those on both sides of its imposing line. But no discovery, in this context, stands alone. What is not perhaps widely known, however, is that the Stanchester find of 2000 is just the latest in a number of important discoveries (some as yet unpublished) of late Roman coin hoards unearthed in the last decade or so, in this area of the modern county of Wiltshire. The find sites command immediate attention, even more so when the evidence they have yielded is taken collectively. Firstly, Bishops Cannings, close to Wansdyke, near Devizes. This was the massive hoard of almost 7,500 coins, discovered ten years ago in 1992 on farmland belonging to the Crown Estates. It was the subject of a treasure trove in 1995 and attracted headlines in the national press and accompanying reported comments suggesting there might be a link here with Wansdyke. It produced one gold coin, 1,569 silver and a massive number (5,837) of bronze pieces  incorporating the largest recorded hoard of what are known as Valentinianic bronze coins in the province. The terminal date of coins in this hoard was AD 395- 402. The hoard furthermore included bronze vessels and, significantly, a military belt fitting along with a few items of jewellery containing a rare jewel-set silver brooch of a type considered to reflect the growing interest in luxury arts as signs of status in the late Roman world. It is worth noting, in the context of this discussion, that the Bishops Cannings hoard found in 1992 contained an especially large mix of bronze and silver coins. What is immediately clear, however, is that this hoard bears obvious parallels with the recent Stanchester discovery (at least in this region and context of this debate). Coincidental or not, this is the area where Wansdyke is still to be seen at its most imposing, as it runs from Morgans Hill to Tan Hill and follows the sweep of the chalk escarpment of the downs. At nearby Roundway Down, another high-status object, a silver ring, was uncovered in separate circumstances, engraved with an imperial bust and bearing the Greek legend NIKE Victory. The latter, it is suggested, may point to the campaign of the commander known as the Valentinian General (the Emperor Valentinian I - AD 363-375), Count Theodosius, to counter the so-called 'Great Barbarian Conspiracy' of AD 367, that may have also, in part at least, involved a widespread rising of disgruntled provincials. Other important - apparently random, non-hoard finds - have come from locations just north of the London- Bath Roman road where, it has been suggested, the builders of Wansdyke probably used the ancient highway as a territorial demarcation line. The latter alignment occurs as the road crosses the low-lying area between Bath and Morgans Hill. Firstly at Gastard, Corsham - a silver decorated bezel from a finger ring, of a type considered to have be made or worn after AD 409 when the empire had lost direct control of the province. And it was near Corsham, where yet another late object of high rank or status has come recently to light - a gold belt buckle. This is of a type previously only represented in Britain by the great gold buckle (dating from about AD 390) that formed part of the celebrated late Roman treasures unearthed at Thetford, Norfolk, in 1979. The so-called Valentinianic coins of the AD 364-378 period are common in the region, and All Cannings, virtually 'next door' to Bishops Cannings, is yet another location where coins of this period have been uncovered, though in a non-hoard context. Coin specialist T.S. Moorhead has conducted the most detailed study yet available of Wiltshire coin finds, focusing on the distribution tables for this key Late Roman period (A.D. 363-78) and the concentration of late silver hoards in the south-west region, most especially those in the county. He discusses suggestions that in this period bronze coins were issued to finance the military, especially on frontier projects, though it has been argued that, increasingly, soldiers preferred payment in silver. Another site is Wayside Farm, just 5 km to the south of the Bishops Cannings find spot, on the outskirts of Devizes. Coins uncovered here at an important Romano-British rural settlement location in excavations in 1999 indicate that the site - which yielded a large number of Valentinianic and later issues - was attracting coinage, and its inhabitants using it, into the early 5th century. The latest coins dated between AD 388-402. The excavators recovered 16 coins from a midden at the site, dating from within a range of between AD 393 and 402. Associated finds, including a lead sheet curse tablet, suggest that the site had religious affiliations. It is worth noting here the evidence from a hoard uncovered at West Park, Bromham (a few miles west of Morgans Hill), in 1981 during ploughing close to a Roman villa not far from the Roman town of Verlucio (Sandy Lane). Although not exactly in close proximity to East Wansdyke, the site is on a parallel line to the earthwork and the London-Bath Roman road. This find, concealed in a small beaker of what is known as New Forest ware, included 20 miliarenses and 396 silver siliquae of mid 4th century date. The hoard is believed to have been concealed in about AD 375. Samples from this find are now on display at the museum in Devizes, along with those discovered at Cunetio, Bishops Cannings and Stanchester. They surely constitute one of the most important concentrations of late Roman hoards to be found in Britain. Significantly, a total of 858 coins from the Valentinian period (AD 364-378) were recovered from nearby Verlucio/Sandy Lane. Certain other sites - though not very close to Wansdyke and therefore strictly speaking outside the scope of this article - deserve to be mentioned. This is where the major site of Cunetio (Mildenhall), near Marlborough, surely comes into its own. It now lies undetectable (but with scheduled site status) beneath a field under regular agricultural cultivation. But its present anonymous presence in the landscape is misleading. Cunetio was once a small cross-roads town but one later transformed into an important military and economic focus for the region, fortified with massive walls and bastions at some point post-AD 367 (the date of Great Barbarian Conspiracy). These troubles produced a robust response from Rome, culminating in a widespread programme of re-fortification under the direction of Count Theodosius. According to some scholars, the unrest may have also taken the form of an insurrection or rebellion following the breakdown of authority. This sounds a real possibility and might go some way towards explaining the presence of the coin hoards, here as elsewhere. It has been suggested that the walls at Cunetio (described as the most formidable Valentinianic fortress so far identified in Britain) were built as a result of visit of Theodosius. There is also a strong accompanying argument that the town, already then a major tax and corn supply depot, was a regional administrative centre and also perhaps a base, even, for a component of the comitatenses, the mobile field army. On a broader level, it is argued that the successful Theodosian military intervention could also explain the increase in the number of bronze coins in the province, because this form of coinage was used to finance the military at this time. The military importance of Cunetio is beyond question. It was not only a fortified town, it functioned as what has been described as a key military base that also served as a tax collecting administrative centre. Many coins have been found here, including the Cunetio Treasure found in 1978 and composed of 55,000 low denomination coins mostly amassed between AD 270-275, its sheer size making it largest coin hoard from Roman Britain. Late Roman coin finds of 1912 at Cunetio were more recently the subject of an illuminating reappraisal study published in 1997. Fig. 3: The huge Cunetio hoard storage jar, in which some 46,000 pieces of a hoard of almost 55,000 3rd century coins were recovered in 1978. Another significant discovery was made in 1990 at Butterfield Down, in south Wiltshire, on the eastern outskirts of Amesbury, within a rich archaeological area some 5 km west of Stonehenge. Here a metal detector user uncovered eight gold solidi of four emperors, including two of Arcadius (AD 383-408) and four of Honorius (AD 393-423), and one silver piece. The latest coin has been dated to about AD 405. Another 925 coins, from the general area of the Down, were also uncovered by metal detector users. Coin use continued into the 5th century and this pattern was confirmed by the presence of issues of the period AD 388-402, thus conforming to the general pattern of late Roman activity in the central Wiltshire region. Another key site that must be included in this study is Castle Copse, near Great Bedwyn, south of Marlborough. We are told that up to 35 villa sites lay within a nine-mile radius of this once powerful symbol of power. This hilltop villa was set out in a large-scale palatial style- evidently a seat of power of someone of rather special. But it has been further argued that, if this site was a rural retreat of a late Roman government official, then it is highly likely that other farming villas would have been located within the confines of its estate. If that were so, then some of the 35 villa sites cited would no doubt have fallen within its administrative embrace and, by implication, the find sites of the major hoards discussed here. In the view of Bryn Walters, Castle Copse is one of the largest villas known in Britain  a site enigmatically linked with the Bedwyn dyke system and, consequently with the sub-Roman defences at Chisbury Castle. He adds: Their probable contemporaneity with Wansdyke suggests a longevity not previously considered possible for a rural villa. Chisbury has produced a hoard of worn late bronze coins considered to represent the last phase of coin use - suggesting here that coin continued in use in Wiltshire until the very end of coin exchange in the province, sometime in the early 5th century AD.. To summarise: of the late hoards (latest coins dating from the opening years of the fifth century) and find-sites cited here, most lay relatively close to Wansdyke. Is this concentration of finds just a coincidence? I think not. But to repeat an earlier question: is there something here that links the depositing of such coinage  the concealment of late Roman/sub-Roman wealth - with the building of the earthwork? Or could it be that the coin hoarding occurred at a time when the presence of the border was not yet marked out as an imposing linear earthwork in the landscape - a disputed line that the building of Wansdyke later consolidated and marked out, for all to see? The discoveries beg further questions: did these hoards have something to do with the collection of funds and/or payments to officials? Could they have perhaps been remnants of pay-chests, or misappropriated funds, even: pay or financial inducements once destined for those supervising or working on local large-scale projects? Or to put I more prosaically, were these simply the long-harboured, buried away belongings of individuals suffering from an age-old human weakness  the obsessive desire to hoard wealth or, indeed, whatever they possessed? Other, equally pertinent questions arise: was hoarding a sign that inflation had rendered the coinage almost value-less, or was it simply a reaction to the unrest triggered by the uncertainties of deeply troubled times? It might be significant, in this area of legitimate conjecture, to look closer at the Bishops Cannings hoard, because it bears close similarities to the Stanchester hoard. It produced one gold coin, 1,569 silver and a massive number (5,837) bronze pieces  incorporating the largest recorded hoard of what are known as Valentinianic bronze coins in the province. Of all the late Roman coin hoards in the West Country containing what are known as clipped silver siliquae, this hoard is considered to be the most important. The clipping of coins in the island province (where it seems to have been unique) is a familiar practice known to scholars, and a number of explanations have been put forward for its emergence. One is that it was an attempt to make the pool of coins in circulation go further at a time when no new issues were entering the province. Another theory is that the coins were reduced to produce a source of surplus silver for the minting of forged coins, while some scholars have suggested that clipping points to a failure on the part of the central Roman authorities to stop the practice  that is to say, the clipping phenomenon occurred after the province had passed out of Roman control, and emerged after the breakdown of that authority in Britain, at the end of the usurper Constantine IIIs reign (407- 411). Clipped coins in hoards are now shown to be have been found most frequently in deposits made after the end of the 4th century and, apparently, in hoards almost exclusively associated with deposits made in the reign of Honorius (AD 393  423). This argument has been advanced in relation to discussion focused on excavations at Segontium (Caernarfon) in North Wales. The Caernarfon fort, a frontier military post in the extreme west, yielded a high proportion of the Valentinianic (AD 363-378) coin type. Clipped or otherwise, silver siliquae coins appear to offer an important dating pointer- but not entirely. Intriguingly, none of the 1,115 examples of this coin issue from Stanchester, had been so reduced  and this very late find has given rise to the suggestion that the practice of clipping might post-date 406  the date after which the hoard was concealed. Elsewhere it has been suggested, in relation to the Bishops Cannings hoard, that clipping of silver coins started in the last quarter of the 4th century and continued into the 5th century. One theory in an area of often conflicting conjecture is that, in general, the coins continued to circulate as late as AD 420. But others argue that coin circulation extended beyond this point, though by then it might not taken the everyday currency transaction form we would understand it, but, rather, bullion/bulk exchange. In other words, by then coinage had become almost exclusively a repository of wealth rather than a medium of exchange. Fig 4: A gold solidus of Honorius (AD 395-423) from the Stanchester hoard. The Bishops Cannings hoard and the subsequent treasure inquest at Devizes attracted national newspaper attention, including the headlined claim that it was the worlds largest Roman coin hoard. It was not. Yet it was clearly no ordinary find, though its prominence in the public mind was soon superseded by the discovery of the great Hoxne treasure, uncovered in November of the same year (1992), on the borders of Suffolk and Norfolk. The Hoxne find - one of the richest treasure hoards of its kind known - incorporated over 14,780 coins and 200 other gold and silver objects. At least 80 per cent of the 14,124 silver siliquae had been clipped. The latest coins in the Hoxne find were two siliquae of the usurper Constantine III (AD 407-11). The view is that the hoard was buried sometime after AD 407 during the period when the Roman authorities effectively abandoned control of Britain. So if a link exists between Wansdyke and these important hoards from the closing years of Roman control of the island province, then it can only be made by examining other late coin discoveries unearthed close to the earthwork in the past decade or so  a period that, in this area, has produced some outstanding examples of late Roman coinage. We have to assume, then, that apart from those making deposits in the ground for ritual- religious reasons, most practical hoarders intended to recover their earthly wealth later, in more favourable times. Why they didnt do so is another, difficult and wider question to explain. In any event, conclusive proof of a direct connection between the construction of East Wansdyke and hoarding, seems almost out of the question. Coin specialists still disagree as to how long the inhabitants of Britain continued to use coins after the end of Roman rule, but the general view seems to be that it is unlikely to have lasted no more than 20 to 30 years. This, it is argued, gives a probable date range of AD 407-450 at the latest  for the burial of the Hoxne hoard. Perhaps much the same argument could be applied to the Bishops Cannings hoard, with its large group of clipped silver siliquae, found - by coincidence and by chance - in the same year (1992) and, significantly, close to Wansdyke. The Hoxne treasures (incorporating the silver coin issues of 15 different Roman emperors minted in a 50-year period of 358-408) and the Bishops Cannings finds share a rare phenomenon  the mix of silver miliarenses and siliquae. Though these coins were struck at mints all over the empire, they are only found - with a very few exceptions - in Britain and Romania, another province that subsequently became 'locked' outside the empire.. It is worth noting here that this rare phenomenon is also shared by the finds at Bromham and Stanchester. It may be just a coincidence, but the Stanchester finds almost parallel in date range those from Hoxne - silver siliquae issues struck, in this instance, during the reigns of 14 rulers from AD 337 to AD 406. These same Wiltshire (Stanchester) hoard discoveries form the cover illustration of the most recent published study on the subject of hoards by Richard Anthony Abdy, who curates the later Roman and Byzantine coins at the British Museum. The author points out here that the typical features of the find are its relatively unclipped siliquae, few forgeries and a strong presence of miliarenses, adding: Is this due to the selectivity of the hoarder or an as yet untouched coinage? On a broader front, he explains that of all Roman silver coin hoards from the empire for the period AD 388-410, 80 per cent are from Britain. He further argues, that recycled coinage continued to be used over a considerable period of time after AD 410. The suggested probable date range for the depositing of the Hoxne finds (AD 407-450) is thus an intriguing one. Was Wansdyke built at some point in this broad period? For this we are told 'East Wansdyke .. was constructed .. with Roman precedents in mind against what was feared to be an imminent invasion of Saxons from the Thames Valley.'. The coin evidence in general is as ambiguous as almost everything else in this context. Yet, despite all the arguments, conflicting or otherwise, the coin finds seem to offer a respectable dating context and, conceivably, help to unlock the key to the age-old puzzle concerning the presence of the dyke - and in a way that no other form of evidence can match. Further, if it is accepted that there is a connection between East Wansdyke and the nearby hoards (and, by implication, a close association between the latest dates of the coins, their placing in the ground and the period of circulation of such currency) then, as proposed earlier, its construction can be narrowed down to the period between the early to middle of the 5th century. Looking at the spread of find locations on a present-day map, it seems that the hinterland to the south of the dyke was favoured by coin hoarders, though admittedly this modern view pre-supposes that the earthwork was in place when the treasure-burying took place. But when in place, it visibly offered a protective zone, a bar to intruders or invaders from the north and thus marking the northern boundary of a rich and prosperous agricultural region. But then we have to concede that it might not have been simply a question of hiding possessions from foes to the north? Anyone with a desire to hide wealth and seek out safe deposit sites might just have been anxious to protect personal gains from more immediate near-neighbours, and not necessarily from distant predators beyond-the dyke. There are other problems. Given the uncertainty amongst scholars about how long the use of late Roman coinage continued into the post Roman period, the question of precise dating is difficult to resolve. But despite all the converging questions, the Stanchester find seems to point to a plausible answer. The background circumstances, along with the evidence from other hoards merit closer examination, even though some of the discoveries have yet to be fully published. Coincidence or not, this is just where - even today - the earthwork follows a spectacularly sinuous and imposing line through the Wiltshire countryside. Yet what applies to Stanchester also seems to apply broadly to that other recent hugely important hoard from Bishops Cannings. The coins, found here in 1992, date from AD 330 to 402. A short distance to the north of Devizes, this find site is as close as any to Wansdyke. Coincidences abound here. The Stanchester hoard (only 11 km to the east of Bishops Cannings) comes almost precisely within the same time-scale, shielded by the same boundary earthwork. The two outstanding hoards, I would argue, tip the balance in favour of a Wansdyke link. The Stanchester coins were deposited in the ground either in the final, troubled years of imperial control, or in the post-Roman period, when coins were beginning to circulate mainly in large hoards rather than as a small change. And that practice, it is suggested, could have continued for up to 50 years or more after the formal withdrawal of Roman authority circa AD 410. Some of the Stanchester coins - found in a field in July 2000 - were struck just a few years before the formal withdrawal of the Roman administration from Britain and the issuing of the famous rescript of the Emperor Honorius (AD 393-423), informing the civitates in Britain henceforth to look to their own defence. Is it too fanciful to suggest that this advice was taken literally and that Wansdyke was one of the reactions to the instruction addressed, as it was, to the civic leaders? For these same leaders may have been troubled by threats on a number of fronts: those from external foes, challenges to their authority and wealth from neighbouring, rival cantons and, maybe even the threats posed by factions stirring civil unrest within their own areas of control. 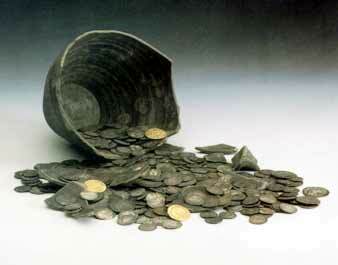 The other finds of similar form  hoards, small coin finds and jewellery  point to what looks like a pattern. Yet quite what form that pattern took is almost impossible to define. But there is one common parallel: most had been concealed in open ground, and lay no more than a few kilometres or so from the north-facing earthwork. Plotted on a map, the find locations almost appear to form a gentle curve running roughly parallel, to the dyke. If, as argued in another context, the conclusions drawn from the study of these finds offer a meaningful distribution sample and not an interpretation based on evidence distorted by the accidental or coincidental circumstances of discovery, then the case for a relationship with the dyke gains some credibility. Further, if this same pattern is indeed a meaningful one, then it follows that the coin evidence offers a plausible dating context for the building of the earthwork. Fowler, Peter (2001): Wansdyke in the Woods  an Unfinished Roman military earthwork For A Non-event, in: Roman Wiltshire and After, Papers in Honour of Ken Annable, edited by Peter Ellis, Wiltshire Archaeological and Natural History Society, (Wiltshire Heritage), p. 179. Eagles, Bruce (2001): Anglo-Saxon Presence and Culture AD c 450  c 675, in: Roman Wiltshire and After, Papers in Honour of Ken Annable, edited by Peter Ellis, Wiltshire Archaeological and Natural History Society, (Wiltshire Heritage), p. 213. Dark, Kenneth R. (2001): Dark Age British Earthworks - An Interview with Dr. Ken Dark, at: http://www.wansdyke21.org.uk/wanart/dark.htm (retrieved May 2002). In the interview, Dark points out here that Wansdyke separates British sites (such as Cadcong, the hillfort of Cadbury Congresbury) to its south, which have Mediterranean pottery, from those to the north (such as Crickley Hill) lacking such pottery. If this is a meaningful distribution and not the pattern of modern discovery patterns, then the boundary  if not the dyke itself  must have been in place by the sixth century at the latest. So, on balance, I think Wansdyke is a fifth or sixth century linear British boundary, facing north and incorporating hillforts in its line. Much the same sort of argument could be applied to Wats Dyke which bears all the hallmarks of a man trained in the military manner  Sir Cyril Fox (1934): Wats Dyke From the Middle Dee to the Severn, in: Offas Dyke: a Field survey of the Western frontier works of Mercia in the Seventh and eighth centuries, The British Academy, Oxford University Press, 1955, p. 271. (see Nurse, K.: Wats In a Name  at: http://www.wansdyke21.org.uk/wanart/nurse2.htm, retrieved May 2002). This frontier ditch-and-rampart earthwork incorporates in its line the magnificent Iron Age fortress at Old Oswestry, Shropshire (linked by tradition to Arthurian legend) and, arguably, a hillfort of similar date some 14 miles to the north in the Welsh borderlands - and site of a later Norman motte-and-bailey at Erddig, near Wrexham. Robinson, Paul (2001): Wiltshire Archaeological and Natural History Society Appeal Notice, January 2001 - Stanchester Hoard: 1,196 hoard of Roman coins and a fragment of a Roman ring found July 2000. The discovery is especially important to us because of its almost certain association with the nearby Roman villa of Stanchester, which was partly excavated in 1931 and 1969. Margaret Gelling, the leading place-name specialist, in England, has written that late Roman villas to which the Saxons later gave the name chester (like Stanchester, or Woodchester in Gloucestershire) were exceptional in some way and may have had an administrative role in Britain at the time of the end of the Roman period or later in the so-called Dark Ages. The latest coins in the hoard were struck in 406 AD, making this the latest dated Roman coin hoard in Wiltshire. Paul Robinson is the curator of the Wiltshire Heritage Museum, Devizes. Robinson, Paul (2002): The Stanchester Hoard, in: Trilithon, newsletter of the Wiltshire Archaeological & Natural History Society No. 45 February 2002: Whether it was concealed and forgotten at the very end of Roman Britain or in the years after Britain had actually shed the Roman yoke, we do not know. It is however important that it can be associated with a nearby villa (Stanchester), the historical significance of which is known, and which lies not far from Wansdyke. Elsewhere, it has been suggested by Derrick Pratt in the Looking Back in Time column (The Leader, Wrexham, November 18, 1994) that the OE place-name Stan- usually signifies a place name with a stone dwelling or road or path, which to the Anglo-Saxons automatically meant a site of Roman derivation. Intriguingly, it has been recently pointed out in the same column that the 40-mile long linear earthwork, Wats Dyke, in the north Wales borderlands, passes through a medieval parish of Stansty at Wrexham, close to the remains of a previously unknown but substantial Romano-British farmstead/settlement site uncovered in the early 1990s. This site has yielded fine tableware pottery types that generally are considered to fall in the ranges typical of small towns with a semi-official (military or administrative) function (Wrexham  Plas Coch. G. W. Wait, Gifford and Partners Ltd, Archaeology in Wales 37, 1997. See Nurse, K.: Wats In a Name  at: http://www.wansdyke21.org.uk/wanart/nurse2.htm (retrieved May 2002). Henig, Martin (2001): Art in Roman Wiltshire, in: Roman Wiltshire and After, Papers in Honour of Ken Annable, edited by Peter Ellis, Wiltshire Archaeological and Natural History Society, (Wiltshire Heritage), p. 122. Valentin, John and Stephen Robinson (2002): Excavations in 1999 on Land Adjacent to Wayside Farm, Nursteed Road, Devizes with contributions from, among others, Mark Corney: The Iron Age and Roman Coins, in: The Wiltshire Archaeological and Natural History Magazine (WAHNM), vol. 95, p. 162. Moorhead, T.S.N. (2001): Roman Coin Finds from Wiltshire, in: Roman Wiltshire and After, Papers in Honour of Ken Annable, edited by Peter Ellis, Wiltshire Archaeological and Natural History Society, (Wiltshire Heritage), p. 90. Moorhead, T.S.N. (1997): A Reappraisal of the Roman Coins found in J.W.Brookes excavation of a late Roman well at Cunetio (Mildenhall) 1912, in: The Wiltshire Archaeological and Natural History Magazine (WANHM). Vol. 90, pp. 42-9. Walters, Bryn (2001): A Perspective on the Social Order of Roman villas, in: Roman Wiltshire and After, Papers in Honour of Ken Annable, edited by Peter Ellis, Wiltshire Archaeological and Natural History Society, (Wiltshire Heritage), pp. 131-144. Moorhead, T.S.N. (2001): Roman Coin Finds from Wiltshire, in: Roman Wiltshire and After, Papers in Honour of Ken Annable, edited by Peter Ellis, Wiltshire Archaeological and Natural History Society, (Wiltshire Heritage), p. 96. Casey, P.J. (1993): Coins in Excavations at Segontium (Caernarfon) Roman fort 1975-1979. CBA Research Report 10, p. 131. The Times  2 March 1995: PC Found Worlds Largest Hoard of Roman Coins . Yesterday a jury at Devizes Coronors Court ruled that the hoard had been intentionally buried by an unknown owner and that all the silver and gold artefacts recovered were treasure trove. Bland, Roger & Catherine Johns (1993): The Hoxne Treasure, British Museum Press, p. 14. Abdy, Richard Anthony (2002): Romano-British Coin Hoards, A Shire Archaeology Book, p. 62. Fowler, Peter (2001): Wansdyke in the Woods  an Unfinished Roman military earthwork For A Non-event, in: Roman Wiltshire and After, Papers in Honour of Ken Annable, edited by Peter Ellis, Wiltshire Archaeological and Natural History Society, (Wiltshire Heritage), p. 196-7. Late Roman Coin Hoards and Wansdyke is copyright �2002 Keith Nurse, used with permission.